A panel method (such as our Panel Flow add-on) is a surface-based, gas and liquid flow analysis technique. Panel methods belong to the field known as Computational Fluid Dynamics (CFD). 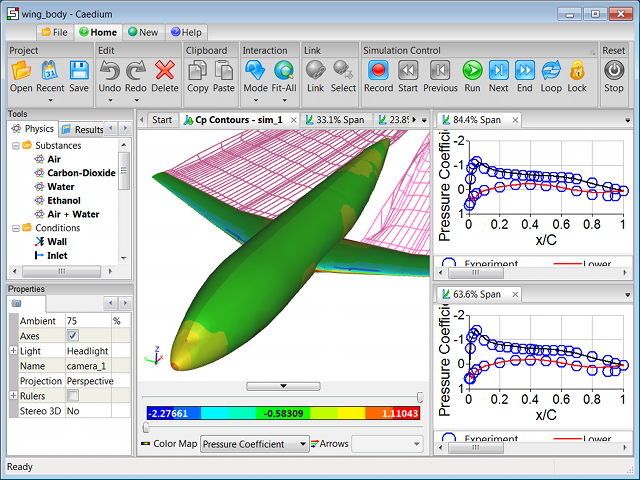 By assuming that compressibility and viscous effects are negligible (potential flow), panel methods can rapidly (at least compared to volume-based techniques) simulate fluid flow over streamlined geometries such as aircraft, cars, boats and submarines, revealing lift forces (the force component perpendicular to the fluid flow direction) and velocity. They can predict form drag (also known as pressure drag and is the force component parallel to the fluid flow direction), but they cannot predict skin friction drag without modification, usually by including a boundary layer technique. An excellent discussion and description of panel methods is available in the book Low Speed Aerodynamics, from Katz and Plotkin.